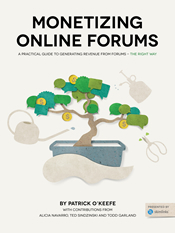 On July 2, “Monetizing Online Forums” was released. The new book, which I wrote with contributions from Alicia Navarro, Ted Sindzinski and Todd Garland, was published by Skimlinks. Thanks to the sponsorship from Skimlinks, we were able to create a real, independent book – not a gimmick – and offer it for free. When you think of free ebooks, you think of teasers. You think of short sighted material meant for list generation – meant to get you to give them your email address. We railed against that notion. We spent money, time and talent and we gave it away for free, with no strings attached. As of last week, that book has been downloaded over 5,000 times. These aren’t inflated numbers. Actually, they are deflated. Some of the downloads come from third party sites where the book is available, but most of them come directly from downloads that we have served. Those numbers are compiled weekly, counted by individual file and IP address. So, for example, if you visit the site tomorrow and download the PDF version 78 times, when the numbers are compiled, you will only be counted as 1 download during that week. If you do the same thing two weeks from now, again, you will only be counted as 1 download for that week. So, this count is tabulated in a very conservative way. I’m really proud that we’ve been able to hit this mark so quickly (just 4 months). From the outset, this was a forums focused project. This is about real online communities and how to monetize them in a way that respects the community. It is about helping people keep communities online and sustainable, affording them with the opportunity to invest more time into managing the community. Thank you to everyone who has downloaded the book and derived value from it. Thank you to those who have taken the time to review it and to offer their thoughts on it, like Jason Falls, Sue John and Carol Lynn Rivera. Much of the credit for this milestone belongs to those who backed the project and contributed to it. First and foremost, Skimlinks for sponsoring it and Alicia and Joe Stepniewski for believing in the idea of it being independent. Aaron Weissman for managing the project, emphasizing the right things and spreading the word. Barbara Somlai for the excellent visual presentation. Meghan Bender, Sarah Ruzgar, Jo Harris and everyone else over there who spent time on it. Outside of Skimlinks, Ted and Todd for contributing their great insights and helping to promote the work. It wouldn’t be anywhere near as good as it is without their knowledge and Alicia’s. Finally, all of our launch partners for helping us to spread the word. This includes ClickMillionaires.com, BuySellAds.com, eMint, Admin Talk, Launch.forum and TopAdmin. Thank you to all of you. I’m interested to see where we’ll be in another 4+ months. We wrote the book for the long term and I wanted it to live beyond the initial cycle of retweets. Time will tell. But, for now, I’m grateful for this milestone. Thank you.